For the October 3 Valley Vegans event, we thought we would do something a little different. We’re going to Manchester to the new album launch of the vegan band Mobius Loop. Buy tickets online — may sell out soon! Please note, 3 Valley Vegans are not arranging transport or buying tickets for people! It is your responsibility to get yourselves to and from the venue. At the time of writing, the last train back to Hebden Bridge leaves Manchester Victoria at 23:22. There are no direct buses between Victoria and the Deaf Institute. Mobius Loop are taking our much anticipated new live album ‘Gemi’ on tour across 9 venues in the UK! The ‘Gemi’ album launch tour is our largest professional venue tour to date. ‘Gemi’ the album is dedicated to our beautiful son Gemi who sadly passed away when he was 10 months old. Every song on the album was written during Gemi’s conception, birth, life and death. Gemi is our greatest teacher and he gives us the courage to share our words, he taught us that any day could be our last on earth and while we are alive we are choosing to follow our musical calling and share our songs with everyone. We are inviting you all to come and share the vibrations with us on a journey through emotional spiritual laments to explosive energetic celebrations. Every one of us has to endure grief and loss at different stages in our lives, we believe that transforming our grief into creativity and sharing it with others is a great step towards healing for each and every one of us. Exclusive copies of our new album will be available on the night. 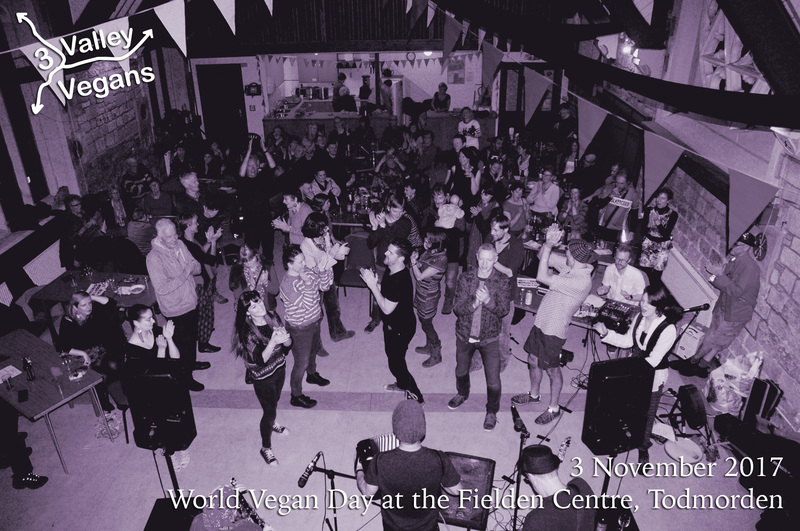 This November, 3 Valley Vegans hosts a gig to celebrate World Vegan Month, supported by the Vegan Society. Featuring balkan gypsy folk band LAZLO BABY and supported by local acts including PHIL REED (from Tod Folk Fest 2015) and STEVE ‘MANIFOLD’ ANDERSON. Added to the bill is a short-but-sweet performance from Irish singer TRIXXI CORISH. > Book your tickets online now! Hot food will be available at the historic and accessible Fielden Centre in Todmorden. Gluten-free options available. Bring your own beer. Places are limited: > Book your tickets online now!